Borobudur is a ninth-century Mahayana Buddhist Monument in Magelang, Central Java, Indonesia. This is the largest and most popular religious temple among the Indonesian islands. The monument is comprised of six square platforms topped by three circular platforms, and is decorated with 2,672 relief panels and 504 Buddha statues. The main dome, located at the center of the top platform, is surrounded by 72 Buddha statues. Evidence suggests Borobudur was abandoned following the fourteenth century decline of the Buddhist and Hindu kingdoms in Java, and the Javanese conversion to Islam. This holy site was lost to the world until 1814 when Sir Thomas Stamford Raffles, the then British ruler of Java, rediscovered its location thanks to help of the native Indonesians. In 1920, a German Company made plaster copies of the wall relieves. Twenty-four of these copies entered the Vatican for the Universal World Exposition in 1925. 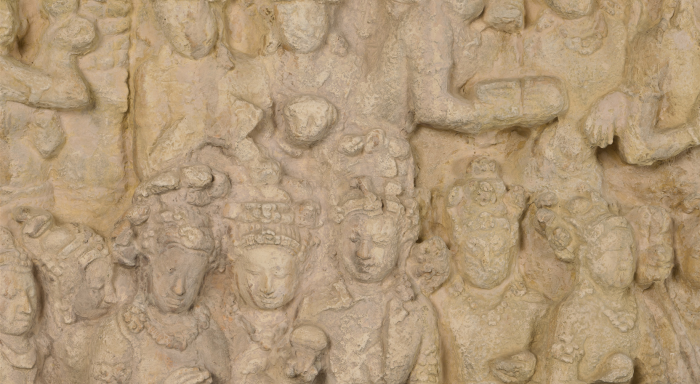 These copies are the only existing plaster copies of the reliefs. The restoration sponsored by the Illinois Patrons will focus on six of the twenty-four copies that need the most repair. This project was carried on in order to save the images which were slowly and irreversibly deteriorating due to humidity and rain corrosion. Borobudur was finally restored through more modern techniques in 1975 and 1982 by the Indonesian government and UNESCO. This piece was pledged in 2009 and completed.